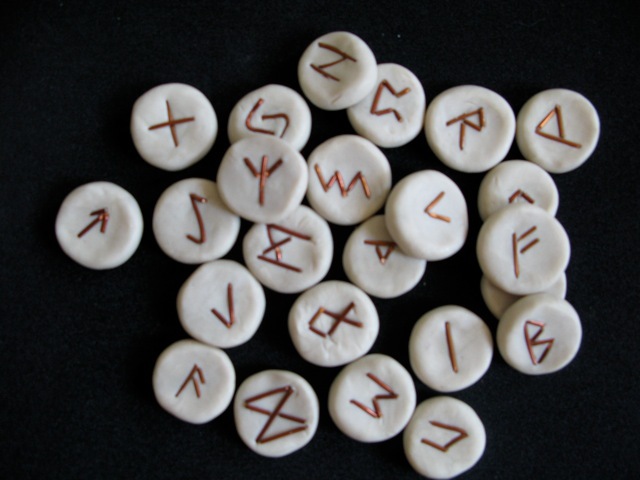 A popular form of divination is runes. It is a set of ancient Germanic letters or inscriptions that legend says came to the Norse god Odin, a relentless seeker of knowledge and wisdom. It is said that he pierced himself with his spear and hung from a branch of Yggdrasil, the World Tree at the center of the Norse cosmos, for nine days and nights, sacrificing himself for the knowledge of the runes, which was revealed to him. He passed on the knowledge to Freya. Heimdall, the god who guards the Rainbow Bridge, taught the runes to man. While rune sets are available in witch shops, book stores and online, I chose to make my own set out of Fimo clay and some copper wire I had around the house. Instead of wire, you could carve the symbols, or draw them on with acrylic paint or a Sharpie pen. You need not make your set out of clay – you can collect 24 shells, pieces of sea glass or rocks. Wash the objects and let them dry. You can pencil each of the runes onto your objects first if that helps. You might also consider chanting the rune name and studying its meaning as you draw it. Another good base for runes are disks cut from a branch. You’ll want to sand the surface and wipe off any dust. Rather than paint or markers, you could carve or burn the symbols. Sealing with a clear acrylic spray or brush-on sealer will help preserve the symbols. Wood that’s been carved or burned can be finished by rubbing with a mixture of olive oil (1/4 cup) and lemon oil (24 drops), with a few drops of any essential oil if you wish. Linseed oil or varnish also seals wood. Using items of nature, know that they are imbued with the spirits, magic and power from which they come. If you make your set with intention or as part of a ritual, their energy will be even more powerful. Saving money aside, this is enough of a reason to make them rather than buying them. No interest in runes? There are other tools you can make using these same objects. 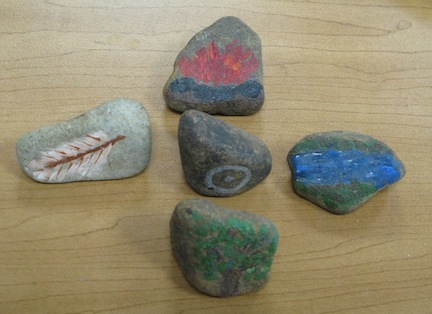 You might make a set of five stones – one for each of the four elements plus center. Paint on the standard triangle symbols or any symbols that have meaning for you. This is a set I made that sits on my desk at the office, and has traveled with me when I went camping. The stones, wooden disks, shells or other objects can also be decorated with sacred symbols that have meaning for you, with the chakras, or with answers to be arranged and used with a pendulum. You could make a divination set similar to Medicine Cards by putting the image of an animal on each and researching their powers, strengths and wisdom. Unable to draw? There’s always stickers, or pictures that are cut out and affixed to a stone or other surface that’s had a base coat of paint or Modge Podge thinned with a bit of water. Affix with glue and use an acrylic finish to seal. I hope you’ll post a photo of what you’ve done. Elementals…..or this is perfect for the solitary practitioner. Blow gently in our Circle this night. Bring your gifts of great wisdom and truth. All Say: Come from the East, come, be with us now! Burn bright and pure in our Circle this night. Bring Your gifts of swift and sure action. For the good of our magical workings. All Say: Come from the South, come, be with us now! Flow smoothly to our Circle this night. Bring your gifts of emotional balance and healing. Bless us with a warm heart for all! All Say: Come from the West, come, be with us now! Plant Yourself securely here in our Circle this night. Bring Your gifts of stability, reliability and solidity. And the best for our highest good! All Say: Come from the North, come, be with us now! You are with us in all ways!